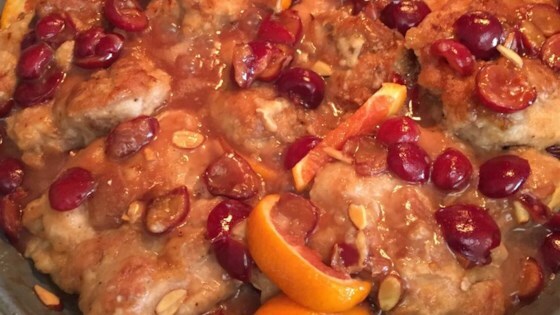 "Lightly floured chicken pieces with the sweet flavoring of dark cherries and orange slices make a great entree that can be served over rice or alone with a salad for a lighter meal. Boneless pieces can be used if desired." Heat the oil in a large skillet over medium-high heat. Season the chicken with salt and pepper, then coat with flour. Fry in the hot oil until browned, turning as needed. Reduce heat to medium, cover and cook for about 25 minutes or until meat is tender and juices run clear. Remove the chicken from the pan, and pour off all but 1/4 cup of the drippings. Return to medium heat and stir in the cherries, reserving some of the cherry liquid for later. Stir in sugar and bring to a boil. Dissolve the cornstarch in the reserved cherry liquid, then stir into the pan. Cook, stirring gently, until thickened. Add orange slices and almonds to the skillet, then return the chicken pieces to the skillet. Spoon sauce over the chicken to coat, and simmer over low heat for 5 to 10 minutes before serving. Almonds can be toasted in a dry skillet over medium heat for about 10 minutes. Stir occasionally.